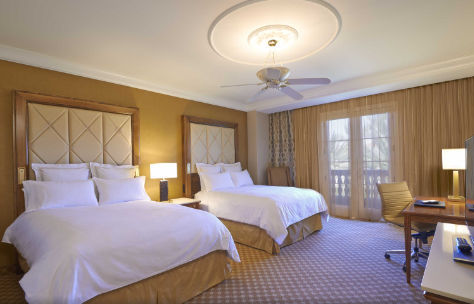 Allow the JW Marriott Las Vegas Resort & Spa to set a new standard for luxury. Situated on 50 acres of lush garden landscape, only 20 minutes from the Las Vegas Strip, our hotel offers an impressive range of premium amenities and an unmatched commitment to outstanding service. Relax in style in our well-appointed, recently renovated hotel rooms before indulging in exquisite cuisine at one of our resort's 10 restaurant options. Take a refreshing swim in our hotel's outdoor pool, complete with cascading waterfalls, pamper yourself at Spa Aquae, or enjoy a night of excitement at Rampart, our on-site casino. If you're looking to host an unforgettable event here in Las Vegas, look no further than our resort's elegant venues, which boast over 75,000 square feet of versatile space. In addition, our prime hotel location places you steps from world-class golf at TPC Las Vegas, and we're also near Red Rock Canyon and downtown Summerlin. NOTE: Rates are subject to amiability at this hotel. Upon submission of this form, please allow 24 hours for a member of our concierge team to confirm room availability with the hotel. If hotel reservations are required immediately, please choose an alternate hotel.